Combine a great whiskey with fresh fruit and you’ve got a whole world of great drinks at your fingertips. 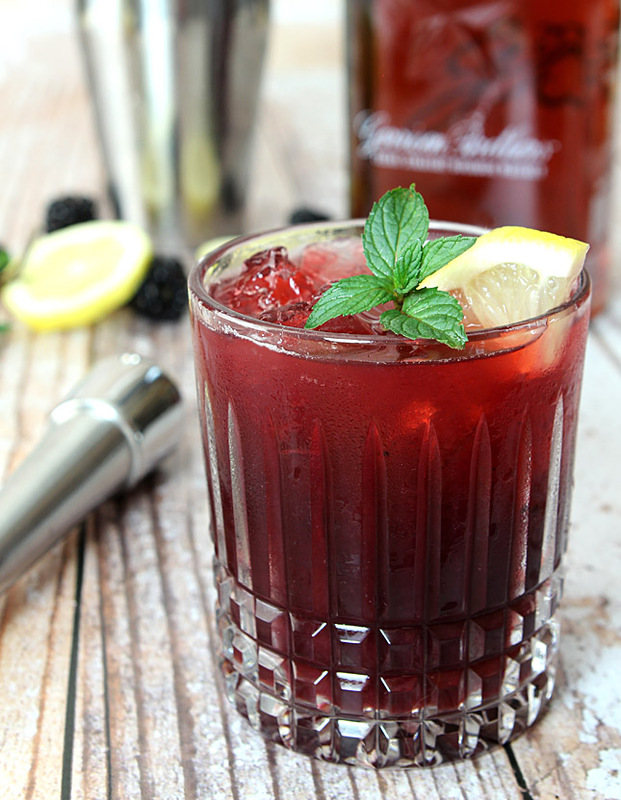 This Blackberry Smash is a delicious blend of whiskey, blackberry and lemon. I first published this post a couple of years ago but when I offered these to guests at my home recently, they claim to have never seen them on my blog. I’m not surprised; a couple of years in blog time is a LONG time and I’ve gained a lot of new readers in the interim. So I’m going to start to check out my archives and probably once a month bring back a favorite. I’ve made a lot of great cocktails since I started Friday Cocktails almost 5 years ago and this Blackberry Smash is certainly one of them! 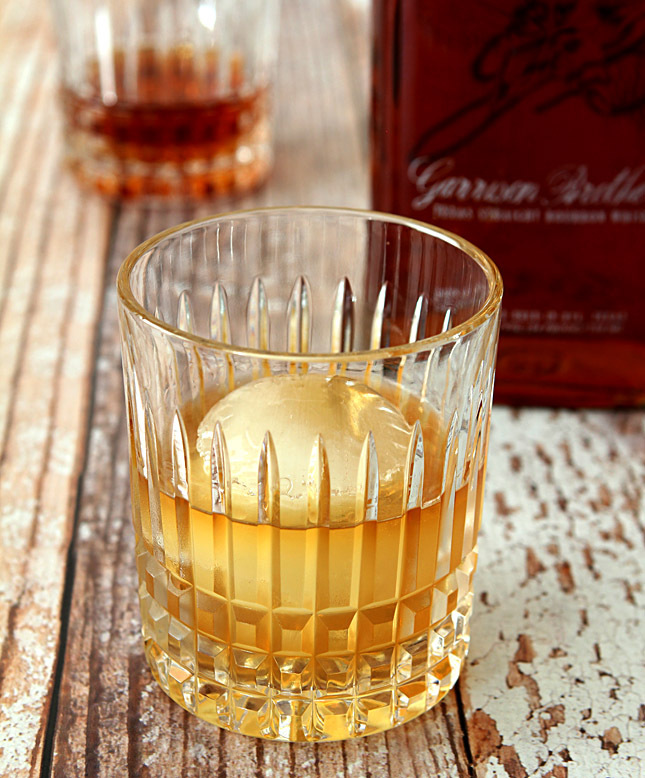 I am regularly invited to come to an event in Denver to meet a restaurant owner or a cookbook author and most recently was invited to meet the owner of Garrison Brothers, a Texas Bourbon Whiskey distillery. While I enjoy these excursions; they are timely, even more so since I’ve moved 30 minutes further South from Denver proper. A trip into the city is now a 2 hour roundtrip affair and I’m saying no more often. So, when I was contacted by the PR firm representing Garrison Brothers Bourbon Whiskey and it was suggested that Charlie Garrison would be happy to come to ME; I was in! I’m so glad Charlie made that trip. We had a wonderful conversation, I learned a lot more about bourbon and yes, I got to sample the Garrison Brothers product like a big boy girl…straight up! Probably my first real experience with ‘sippin’ whiskey since I am a cocktail maker and let me tell you, it was good. And Charlie and I had just enough to laugh and chat far longer than we expected! Charlie is a friendly guy, no pretense at all and with the requisite Texas cowboy hat; even if he now lives in Arizona (well, sort of). He commutes between Arizona and Texas and it was a charming story of bourbon and family and well, in truth, keeping his wife happy. I had to respect that! I enjoyed the story of his brother having an idea and sharing it with Charlie and their father who both thought he was crazy and who were soon hopping on the crazy train and starting a business that some might call suspect. Bourbon? NOT in Kentucky? And that is a story but it was not without a conscious decision and from what I could tell; a really good one. 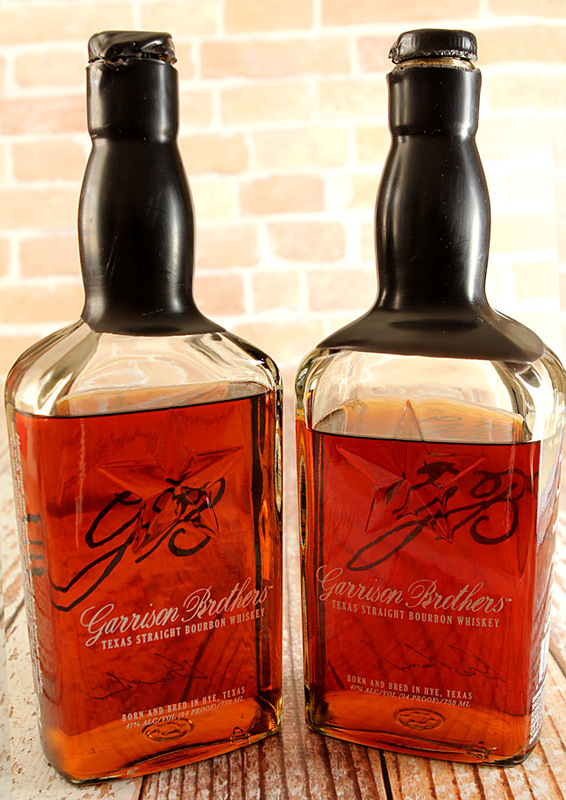 Garrison Brothers are a family owned and operated distillery out of Hill Country Texas that’s made from corn-to-cork, with organic grains grown on the property and Hill Country rainwater. They were the winner of the 2014 American Micro Whiskey of the Year Award and they pride themselves on the distinctive quality of each barrel and hand number and sign every single bottle that leaves the distillery. The art of making whiskey is expansive and I have a much greater respect for all of the craft artists in this genre. From what kind of grain is using to the securing of enough barrels; how the heat of Texas affects their product and the method for making it and how all of that contributes to the costliness of the enterprise. Still, when the outcome has a scent that is so aromatic and intoxicating that you were left wishing you had it piped into your home (now THAT’s an idea Charlie!) it truly is worth it. Charlie brought two sample bottles for us to try. Well, for him to drink and me to try; I’m thinking he has tried plenty. They were the same bourbon but from two different years and the difference was evident; the color and taste of one year was both lighter and sweeter than the other year and Charlie explained that several things can affect that. The temperature, the grains used each year, the casks…everything together serves to create a bourbon that has an expected outcome of quality but with the opportunity for all of those components to make for slightly different color and flavor nuances each year. One thing the Garrison Brothers do that sets them apart is that their mix each year starts with sweet mash, not sour mash. Much like the starter from sour dough, bourbon distillers typically cull some of the mash from one batch to use as a component in the next batch (they even borrowed the sour name part from the sour dough bread process; sour mash is not sour at all). Garrison Brothers have chosen to not follow this tradition but start with new grains every year, i.e. sweet mash and the result makes for a bit sweeter and differently nuanced bourbon. While bourbon whiskey of this caliber is most often enjoyed either straight up or over ice; I knew I wanted to make a cocktail. I chose to make a Blackberry Smash with the Garrison Brothers Bourbon Whiskey because I knew a super sweet girly girl cocktail would just be wrong with such a high quality bourbon. The tartness of some blackberries and a bit of mint, lemon and sugar really allows the bourbon to be forward and this was a most excellent cocktail. Though I sure enjoyed sipping and chatting with Charlie too so I’ll be doing that straight up business again. Each year when it’s time to bottle, people from near and far volunteer to be a part of the process. Their reward? Yup..it’s booze! Allowed to partake while they’re working and more to take home, I’m certain for everyone the best rewards are memories of a lifetime. I was so tickled by the seal on the two bottles Charlie brought with him. One had a nice, even seal but the second bottle (on the left in photo above) was far off the mark. Why? Well most likely because that worker had imbibed a bit too much on his shift! Want to try something special and unique? Search this one out. Served in some of Denver’s finer establishments it’s also now available locally in liquor stores too. Their distribution is growing but right now only available in select states. Keep asking…this is worth waiting for. Because of the size of blackberry seeds, straining through the lid of a cocktail shaker was not efficient. I found it a better alternative to put a strainer over a small pitcher or medium bowl and strain using a medium kitchen strainer; from there I poured the mixture into an ice filled glass. 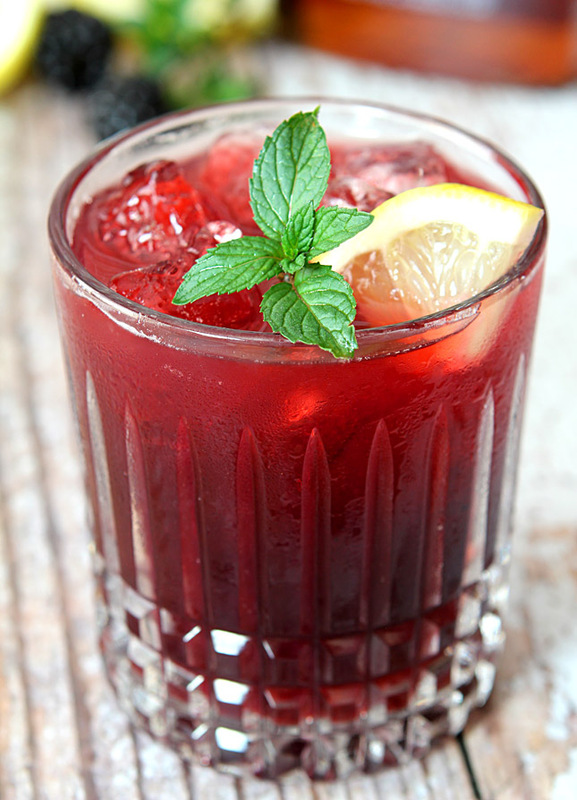 Muddle lemon slices, blackberries and mint in a cocktail shaker. Add bourbon and simple syrup and fill shaker with ice. Shake at least 10 times and strain into a short glass filled with ice. I make at least a cup of simple syrup at a time; having it on hand in the refrigerator instead of having to make it and wait for it to cool is a great timesaver. Simply combine equal amounts of water with sugar and heat until the sugar dissolves. Chill before using in a cocktail. My quick and dirty method? Mix one half the amount of water with the sugar and warm until the sugar is melted. Pour that mixture over the other half of water...in the form of ice cubes! Instant simple syrup. I was provided with bourbon from Garrison Brothers Distillery but all commentary is my own. may impact a female’s pregnancy. Oh yum!! This drink looks so tasty!! Never met a smash I didn’t like! Fun to see this again. You’ve done so many wonderful cocktails, it’s a great idea to bring back some of your best hits. Cheers! Add a bit of white cranberry juice, I dare you, yum! I found that the missing touch. I loved it just the way it was but I’ll remember that…if I can find white cranberry juice. I don’t recall ever seeing it on a grocer’s shelf! Oh this is calling my name! Definitely making it this weekend. 🙂 Thanks Barb! One of my favorite fruits; sometimes I love the more tart element with blackberries and they are certainly beautiful. OM Goodness, what a great sip. I’m a sucker for a handsome bottle of the hard stuff. This was so good; even the straight up version; shows that the time and effort for small craft batches really does make a difference and I was lucky to get to experience it. I do love any drink with the word smash in it! yum! this looks AWESOME. could definitely kick back with a couple of glasses now… thanks for sharing another great recipe.. i definitely see myself recreating the recipe! The thing about a smash that I love…so versatile. Change the fruit and the liquor and you can make a billion varities! Enjoy Thalia! What a great story of how the Garrison Brothers Whiskey got started. I, also, think it is so cool that they have people come in to help them the bottling process. I am sure my bottles would start to look a tad ‘off’ halfway through the process. Love your choice of ingredients to mix with the whiskey. They all complement the star ingredient, beautifully. It was great to meet an owner Betsy and hear their story; gives a whole new feeling to a brand when you have some intimate knowledge and KNOW the passion behind the product. Yeah…me too but I would sure love to be there for one of those bottling events wouldn’t you? I love this story Barb – and I am not surprised that the two bourbons tasted different! I will be looking for a bottle of this bourbon when I’m in Texas – can’t believe the gorgeous color of this cocktail and love that you kept it so simple so that the bourbon really comes through! Great minds think alike (once again!) — I’m doing a classic Brandy Smash next week. 😉 Love the idea of blackberries in this. And bourbon works so well in a smash. Fun (and tasty!) drink — thanks.